It seems every time I turn around some one is having a baby. Is that happening on your end too? With all these little ones coming along I've been trying to put together baby gifts. I began knitting this hat for my neighbors. Their daughter was born in March and this being their first child it's all kinds of exciting on the street. 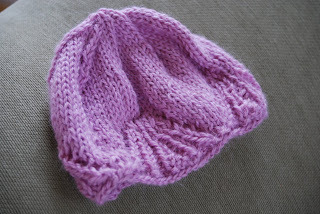 Since they knew the baby was going to be a girl it made it easy for me to choose a knitted gift, or at least the color. I had a difficult time choosing the right kind of hat. It had to be delicate and pretty but not over the top frilly. After spending a few minutes on Ravelry I found the perfect hat. The pattern, "Baby Hat" is from Leigh Radford's book One Skein: 30 quick projects to knit or crochet. Besides this great hat there are several other wonderful things to make. I have my eyes on the cupcakes, they look like a fun project. I chose a soft pink yarn from my stash, Alpaca with a Twist Baby Twist, which is a great yarn for baby gifts. One skein will yield two hats in the infant size. The pattern uses an umbrella lace pattern for the border to give it an elegant look. This hat has plenty of growing room and by fall I hope to see the little one next door wearing it on her afternoon strolls. There are 3 more ladies expecting babies on our street, one in June, another in August and another in October. I've got my work cut out for me. Plus my cousin Lori has a baby due in June, that hat is on the needles and nearly complete. That hat is a made up pattern and I'm working out the details. Oh, my I nearly for got about my dear friend from high school. Oh yeah, a nice surprise has to be made for her second babe. I've got 4 more gifts to think about, something different for them all and that is the best fun ever. 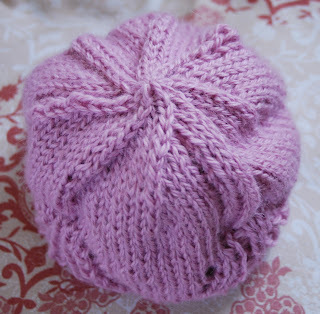 What a lovely hat -- I'm finishing up my baby blanket and am about to begin several smaller baby projects. So many people (past and present) have gotten pregnant in the past year that I'm wondering what's in the water.